Released 15 September 2008, reached no 5, on chart for 6 weeks. Reissued on 7 May 2012 on the Universal label. 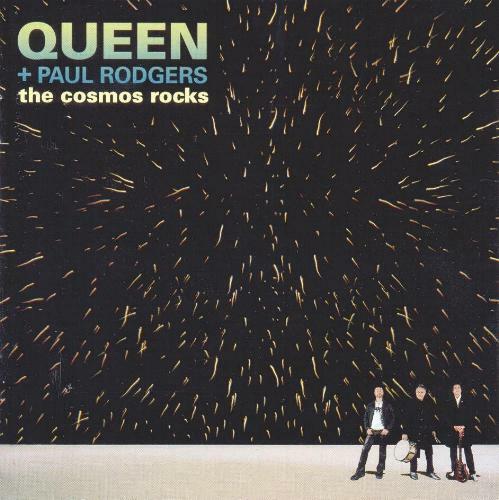 Produced by and performed by Brian May, Paul Rodgers and Roger Taylor. In addition to the normal CD and LP issues, this album was also released as a CD and DVD set containing a DVD of highlights from the 'Super Live In Japan' DVD. Track 1. Written by Queen and Paul Rodgers. Length 4:11. This track was later recorded by Roger Taylor and included as a bonus track on the 'Fun On Earth' album on vinyl and in 'The Lot' boxed set, retitled as 'Whole House Rockin''. What planet is this, hmm? Track 2. Written by Queen and Paul Rodgers. Length 4:23. Track 3. Written by Queen and Paul Rodgers. Length 4:03. This track includes a short instrumental excerpt of 'We Will Rock You', lasting approximately 12 seconds. Track 4. Written by Queen and Paul Rodgers. Length 4:40. This track was later recorded by Roger Taylor for his 2013 album 'Fun On Earth', and credited as written by him. Track 5. Written by Queen and Paul Rodgers. Length 3:18. This track was previously performed live by Paul Rodgers and a version is available on his 'Live In Glasgow' album, length 3:43. Track 6. Written by Queen and Paul Rodgers. Length 6:08. Track 7. Written by Queen and Paul Rodgers. Length 2:59. Track 8. Written by Queen and Paul Rodgers. Length 4:28. Track 9. Written by Queen and Paul Rodgers. Length 4:03. This track was later recorded as an acoustic version by Kerry Ellis in 2010 (featuring Brian) for her debut album 'Anthems', retitled as 'I Loved A Butterfly'. A live version was also released on the 'Acoustic By Candlelight' album in 2013. Some sources suggest the track started as a Piano Solo, known as 'Butterfly', which was recorded during the 1986 'A Kind Of Magic' sessions, although I cannot hear any similarities myself. Track 10. Written by Queen and Paul Rodgers. Length 3:37. This track features Foo Fighter Taylor Hawkins on backing vocals. Track 11. Written by Queen and Paul Rodgers. Length 4:53. Track 12. Written by Roger Taylor. Length 4:01. All performances prior to 2007 were acoustic versions with lead vocals by Roger, the album and subsequent performances all feature the full band, with vocals shared between Roger, Brian and Paul. The track was first performed at the 46664 South Africa concert in 2003, and it was later recorded by Roger Taylor for his 2013 album 'Fun On Earth', featuring Jeff Beck. The studio track was released as a free download on World Aids Day on 1 December 2007, and due to demand it was then given a proper single release on 31 December. The album version seems identical to the original download. Track 13. Written by Queen and Paul Rodgers. Length 5:55. This track segues into the reprise of 'Small'. Paul sings most lead vocals, Brian sings the 'surf's up... school's out' lyrics, and Roger sings the 'follow that dream' lyrics. Track 14. Written by Queen and Paul Rodgers. Length 2:03. This track segues from 'Surf's Up... School's Out! ', and is mostly instrumental. Written by Del Shannon and Max Crook. Length 5:29. This track is only available as a bonus track on the iTunes download. The track was originally recorded by Del Shannon, and reached no 1 in 1961. This is the only the second Queen studio track to be released which was not written by the group (the first, 'New York New York' was only included in the film 'Highlander'). This track was written by Paul Rodgers and was performed throughout the 2006 North American Tour. It is believed to have been recorded for the album, but the studio version is currently unreleased. The transcription below comes from the show in Deluth, on 7 March 2006, length 4:32.